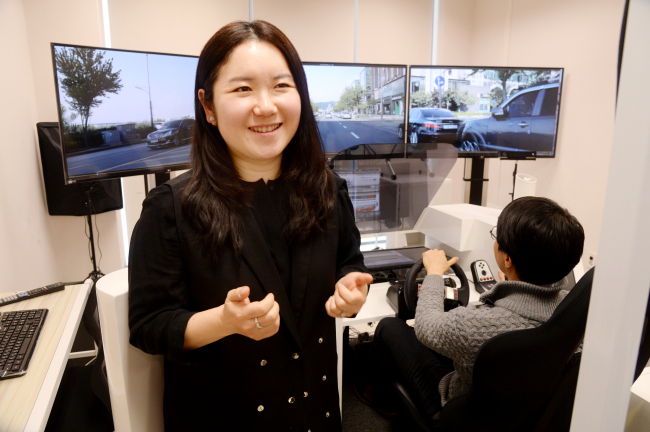 Designing technology projects for the future requires a radical change in thinking as social demographics shift and ubiquitous connectivity changes the way people interact with the world around them, says Ju Da-young, an assistant professor at Yonsei University who heads the Technology and Design Research Center. The center is part of the Yonsei Institute of Convergence Technology, a school set up to explore how different disciplines can come together to create new ideas. “We’re seeing completely new ideas emerge. It’s more a process of creation than improvement. For convergence to work, it is important for specialists who are equally knowledgeable in their respective fields to come together,” Ju told The Korea Herald in an interview at Yonsei University’s Songdo campus in Incheon. The TDRC, formed four years ago, is a test bed for Ju’s vision of convergence, bringing together 10 specialists in fields varying from engineering and design to law and philosophy to find innovative technology solutions for the future. Under her direction, the TDRC tries to tap into the research methodologies of its specialists’ various fields, which often leads to unexpected solutions. Sometimes, they receive projects that were first assigned to a different team but could not be solved. The TDRC’s projects focus on researching how technology can be harnessed in ways that will be in demand among consumers five to 10 years down the road. Some of its projects currently focus on the future potential of technologies such as artificial intelligence and flexible displays. The center works on exploring human machine interaction, as well as user experience and user interface and searching for new value that technologies can create through sensory experiences. “When a problem cannot be solved through existing methods, it means that there is very little literature or research data to rely on. It’s up to us to try out different approaches from our respective fields and to maintain a high level of productivity,” Ju said. The team takes on about 10 projects a year from private companies such as SK Telecom and Samsung Display, as well as governmental organizations. The projects total about 700 million won ($658,000) to 800 million won each year in research and development budget. In October last year, TDRC joined SKT and its counterparts in Seoul National University and Daegu Gyeongbuk Institute of Science and Technology to develop original technologies related to autonomous vehicles and commercialize such vehicles in the early future. For the project, the TRDC is responsible for looking into interactions between human drivers and machines. As conceptual as the research may seem, Ju said that the TDRC is unique because it has the capacity to produce not only ideas but also prototypes. Ju herself is a product of Korea’s earliest efforts to produce specialists that converge different fields. Trained as a painter at Hongik University, she went on to pursue engineering for her graduate studies, focusing on areas such as video special effects and augmented reality. “If possible, in the future I’d like to work with specialists who have expertise in learning, or music,” Ju said. Looking ahead, Korea’s aging society could bring opportunities for the TRDC. “Technological innovation in the future is going to revolve hugely around health care, so I would also like to bring in a doctor, or perhaps even someone who specializes in physical therapy,” she said. She added, “Since we are strong in technology, we’re interested in how IT can change everyday life for this group, for creating a type of standard” for what should be considered when creating products for the elderly. For example, Ju considers how self-driving cars could be customized for elderly users to reduce the risk of accidents, and how those ideas can be commercialized. As a mother of a child with a disability, Ju is also interested in using technology to improve the daily lives of young children. “Children make up a very small group, but our future depends on how we educate and shape the lives of this group,” she said.